Burial sites comprise a large portion of the Bronze Age archaeological evidence, particularly for the early part of the period. 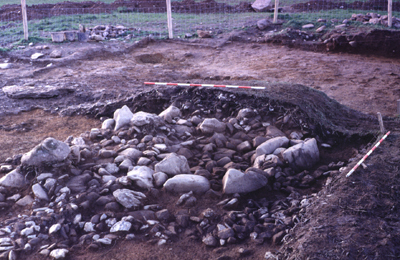 Unlike funerary practices in the Neolithic, Bronze-Age burials are not in the main monumental in character and are generally in cist or pit graves, or in rarer examples in cist cairns or flat cemeteries. The megalithic tomb tradition particularly wedge tombs such as Aughrim Co. Clare, remained in use for a transitional period between the Neolithic and Bronze Ages. A second common trait and underlying motif of this phase of burial custom was the inclusion of pottery vessels. The construction and style of the grave itself varied. The remains, burnt or as inhumations, were usually placed in a stone cist or a pit, often accompanied by grave goods of semi precious stones, jewellery or weaponry, some were marked with a mound of earth or a cairn of stones. Burials often occurred in groups or cemeteries, called barrows or cemetery mounds, being a circular mound used to enclose several burials ranging in date from the Late Neolithic to the Early Iron Age. Ballinagore, Co. Wicklow is an example of a Bronze Age cemetery with a number of cists with associated pottery uncovered in a mound with three ring-ditches to the west. This wedge tomb is located on Church Hill at the south-east flank of Slieve Rushen (Fig. 7.1.1). A single season of excavation was undertaken in 1992 that exposed an outer kerb retaining the cairn and uncovered three cist burials inset against its inner edge. 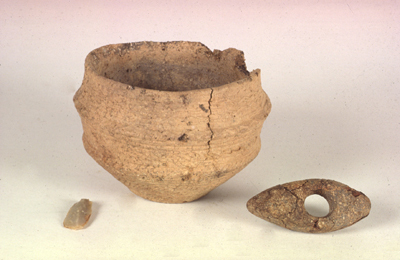 Inhumed and cremated bone, Beaker and Food Vessel pottery were recovered from below the cairn and inside the gallery, underlying a compact stone surface. Buttress stones were set at right angles against the outer face of the gallery of side stones, some of which worked with the side stones to support the whole structure. The information recovered from this wedge tomb is important for a number of reasons. Of the approximately 500 wedge tombs in the country only about 25 have been excavated to date. Many of these excavations did not produce good information regarding the date of the construction and use of the structures. The site produced a good stratigraphic and temporal sequence of use and this makes it important in the study of wedge tombs where the few excavated examples have not produced evidence for dating the construction and use of the monuments. Aughrim wedge tomb produced evidence for both cremation and inhumation in the early use of the monument and combined with the human remains from the later insertions this will provide additional valuable information on regional variety in Bronze Age burial practice. Channing, J. 1993 ‘Aughrim’, In I. Bennett (ed.) Excavations 1992. Wordwell Ltd. Wicklow. 4. The cemetery is located on a gentle south-east facing slope, about 140m to the west of the Goldmines River (Fig. 7.2.1). 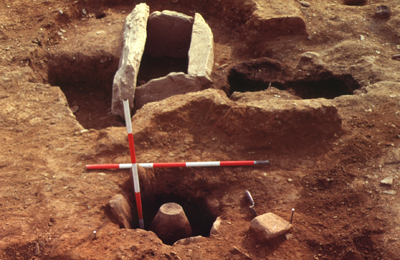 A rectangular stone-lined cist was discovered during the bulldozing of field fences. A limited excavation of the cist was carried out by Mary Cahill of the National Museum of Ireland. This resulted in the recovery of an Early Bronze Age bowl Food Vessel, a stone battleaxe and a flint knife (Plate 7.2.1). Human remains were not found in this cist. Subsequent excavations carried out by Barra Ó Donnabháin over thirteen weeks between 1994-95 resulted in uncovering of the remains of a portion of a low earthen and stone mound (Plate 7.2.2) that was found to survive under the late nineteenth century field fences. This mound was immediately north and east of the rectangular cist and may originally have covered that structure. An arc of a stone kerb was found within the mound and this incorporated a second, small, rectangular cist containing cremated human bone that had been disturbed (Plate 7.2.3). An undisturbed polygonal cist was found under the mound, 2m north of the first cist discovered. The polygonal cist contained an inverted collared urn with cremated human bone inside while the cist had been packed with charcoal after the urn was inserted. Two more collared urns were found in pits adjacent to these two cists. One had been inverted over a cremation and a second, that contained a small deposit of cremated bone, lay on its side in a pit filled with charcoal. A pit containing an unaccompanied cremation was also found adjacent to the original rectangular cist as were post- and stake-holes. A complex of charcoal-filled pits with charcoal from hazel and willow rods that had been burned in situ was also found. This was concentrated in the area to the south-east of the original cist and may also have originally been covered by the mound that seems to have been mostly removed in the nineteenth century. About 100 sherds of Neolithic pottery were found in the area of the low mound and these represent six round-bottomed shouldered bowls. Many of these sherds came from the construction pit of the first cist uncovered. Three ring-ditches were found in an arc to the west of the area of the low mound. Two of these were penannular while one was circular. All measured 5-6m in diameter and had shallow U-shaped ditches. The circular example was the most northerly of the three ring ditches and had a cist at its centre. This contained cremated human bone and a poorly executed vase Food Vessel. The middle of the three ring-ditches had a small pit at the centre with charcoal and small fragments of cremated human bone. The third and most southerly of the three ring-ditches was not fully excavated. One pit within this ring ditch was investigated. This was 1m deep and contained charcoal and human bone. A barbed-and-tanged arrowhead was also found in this deposit. The area of this third ring-ditch was inadvertently disturbed subsequent to the excavation and the landowner uncovered a pit with a cremation and a possible vase Food Vessel. A substantial V-shaped ditch, 3m wide and 2m deep, was found c.16 m east of the low mound. There was nothing to indicate the date or function of this feature and its relationship to the prehistoric site is unclear. While Early Bronze Age cist graves are accidentally discovered quite frequently, the surrounding area is not always investigated. This excavation provided the opportunity to do this and uncovered a cluster of associated mortuary remains and evidence of a Neolithic presence at the site. This excavation provides an opportunity to examine variability and spatial patterning in mortuary behaviours in an Early Bronze Age cemetery. Ó Donnabháin, B. 1996 ‘Ballinagore’, In I. Bennett (ed.) Excavations 1995. Wordwell Ltd, Bray.